Washington Hall, On the Boards’ historic home, continues to be a fitting space for the 12 Minutes Max series, whose March edition opened Sunday, March 23. Curated by Jaycee Coleman, Ilaria Ghattas, and Brett Love—Ambassador Team 4 for the 2013-14 season—this edition was heavy on theater and relatively light on straight dance, but four movement-focused acts held their own. Amy Johnson made her 12MM choreographic debut with Crept-dead-star-time, a duet she performed with dancer Danica Bito. The piece had an intriguingly sci-fi, almost space western feel with the two dancers’ linear movement and close relationship turning them into fearless travelers of time and space (some repeated text hinted at this, as well). Well-chosen costumes capitalized on the physical similarity between Johnson and Bito, with both wearing matching bobs and black velvet jackets with epaulets—a doubling that bolstered the sci-fi effect. For most of the dance, their movement was linear and rhythmic, an offhanded floor leap or an extended balance showing, but not showing off, their technical skill. The high ceilings of Washington Hall provided an appropriate setting for a piece about space, as the size of the room highlighted how small Johnson and Bito were in the expanse. The human relationship between the two developed as they went on their journey, though this is an element that could use a bit more defining. Johnson has laid some strong ground, with a clear vision for the aesthetics and atmosphere of Crept, and a long-term investigation could yield a rich work indeed. Now to a different subject: clowns. How does one talk about clowns? And where do they fall in the theater-movement-dance spectrum? Mainstream culture has largely sidelined the noble clown, but a good clown is built on a keen study of both physical expression and human nature—it will make you laugh and cry all at once. 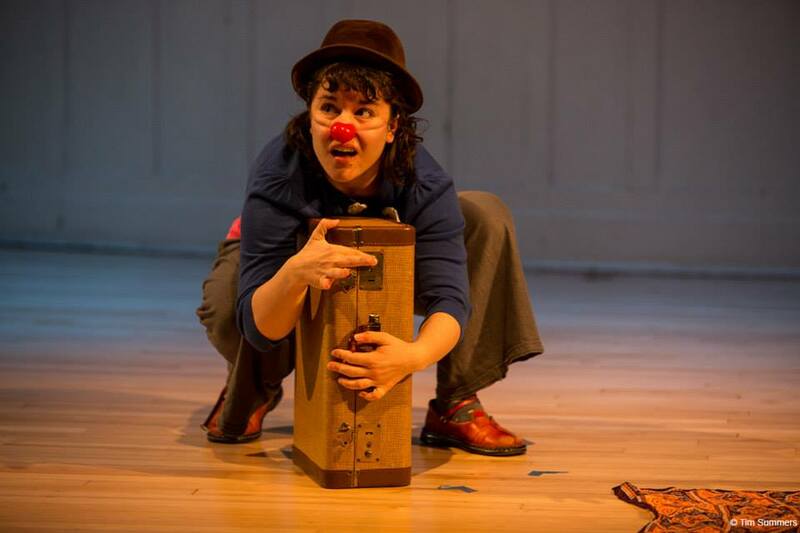 Christine Longé made herself into a very sweet clown for Anenome’s Suitcase. Accompanied by Debussy’s always-poignant Clair de Lune, Longé’s red-nosed Anenome entered lugging a heavy suitcase which she opened to reveal a crumpled paper, which, as she unwrinkled it, turned out to be a heart. Hopeful now, she guarded her heart carefully before putting it back into her suitcase. It’s a simple set-up, of course, but Longé performed the scenario with aplomb. With such attention to how her body interacted with her props, not to mention the importance of visual metaphor, her act fits neatly in a dance context, and proves that not all fine physical performers need to spin and kick their legs to communicate. Devin McDermott’s Go Team cracked open the peppy cheerleader stereotype to reveal glimpses of the emotional life of the individuals involved—cheerleaders, yes, or maybe just the ambiguously competitive emotional life of female friendship. 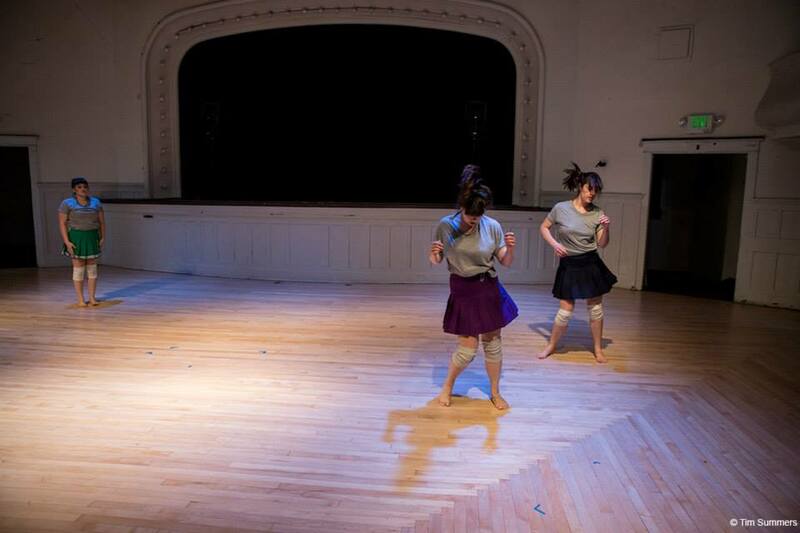 McDermott performed with dancers Johnson (in her second performance of the night) and Jamie Maslach, and the three took on abstracted versions of cheer postures interspersed with both bouncy moments of rocking out and more straightforward dance phrases. A major motif of Go Team centered around slowly dropping the peppy smiles to reveal a vulnerable, sad expression and then eventually reigniting the glee. In these moments, the dancers seemed to question their relationship to one another. Their friendship felt tenuous, switching between moments of unity before one, usually McDermott, split from the group to do her own thing. The final section illustrated the instability of their relationship particularly well: Johnson and Maslach had a duet on the floor (were they helping or hindering each other?) before Johnson left to join McDermott’s camp in the corner. The lights went down with Maslach inching her way into the splits, either the victor or the one left out, or perhaps both. Like Johnson’s choreography, McDermott’s Go Team is a strong start to future work on the topic. 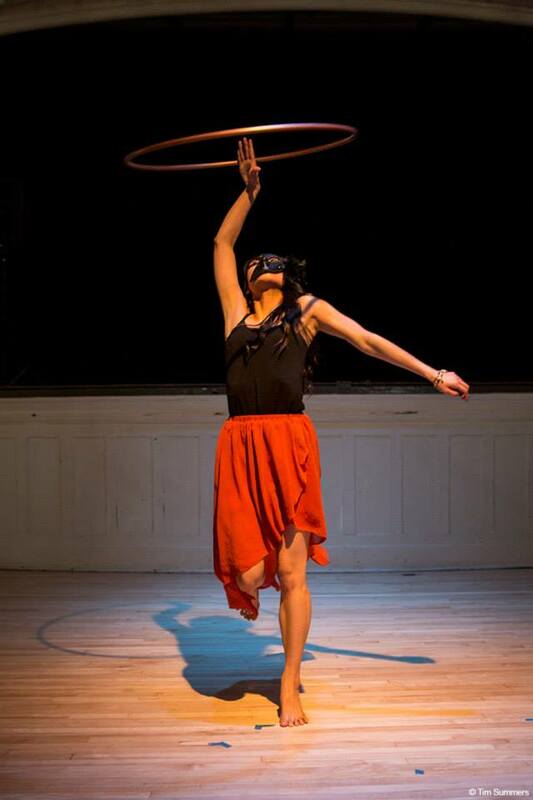 Annie Boitano’s Finding Flow closed the evening with a short bit of pure dance—hoop dance, that is. Boitano’s dance was mesmerizing. She spun inside her hoop, not larger than two or three feet in diameter, and then she rotated around the hoop. The hoop became an extension of her body over which she exerted precise control, while simultaneously appearing relaxed and free in all her movements. At every moment something was moving effortlessly, and often her hoop appeared to float. The dance was full of little illusions; the mask she wore added a sense of magic to her performance. Boitano’s piece was an unexpected end to this 12MM, but a wholly delightful one. The fifth and final 12 Minutes Max of the season will take place May 4-5 at Washington Hall. Find out more about current and past 12 Minutes Max artists here.